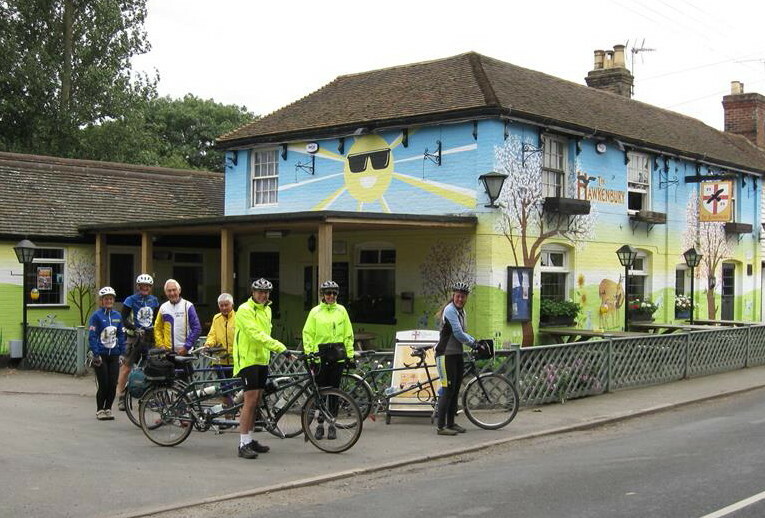 For a list of all tandem events in and around Kent, click on the Diary 2013 page where (as well as our events) you will also see events and rides organized by both the Tandem Club South East London and the Tandem Club Surrey & Sussex. This ride was cancelled due to the snow. 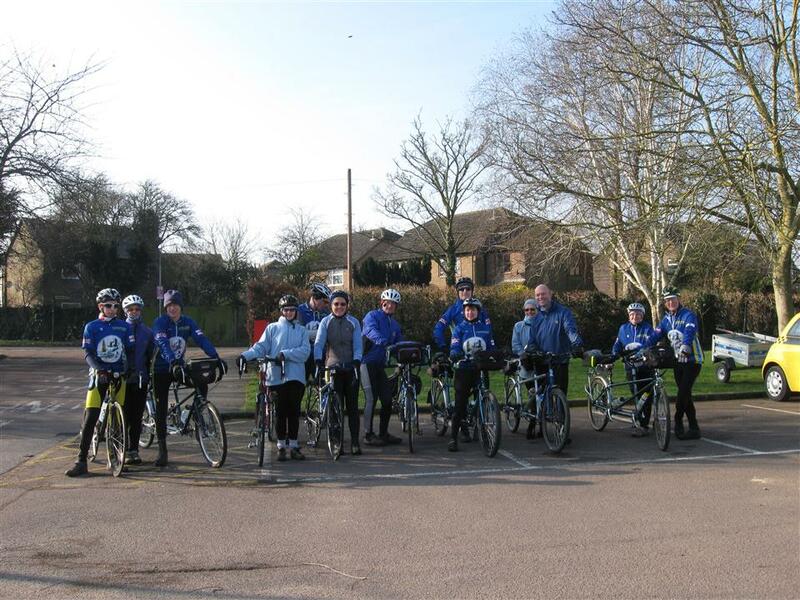 Six tandems and two solos set out from Ditton Community Centre in brilliant sunshine. 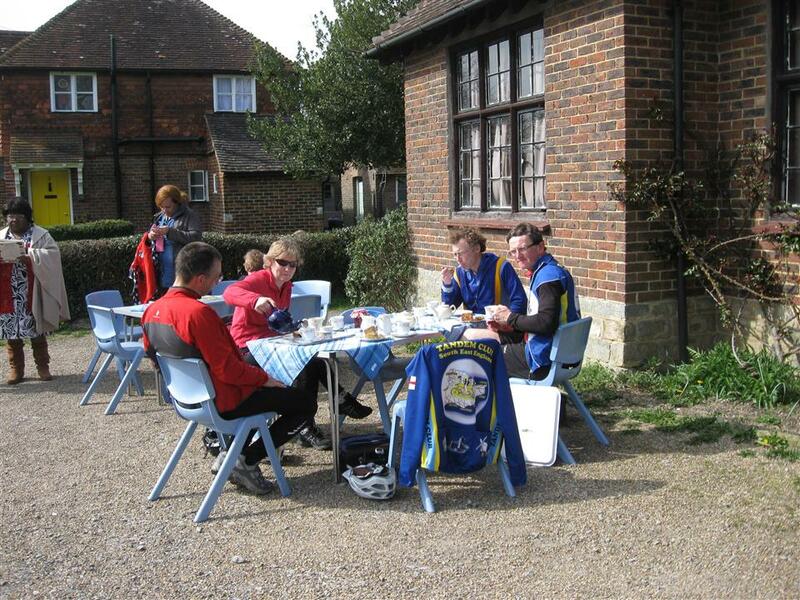 Weaving our way in and out of country lanes for 9 miles we arrived at Spadework’s in Offham for our coffee stop. 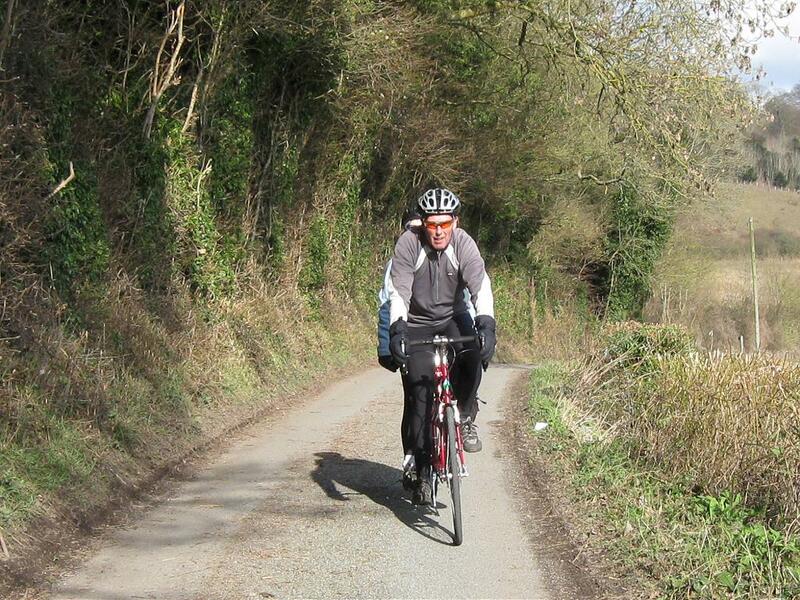 From here we cycled through Trottiscliffe up onto the scenic Pilgrims Way. 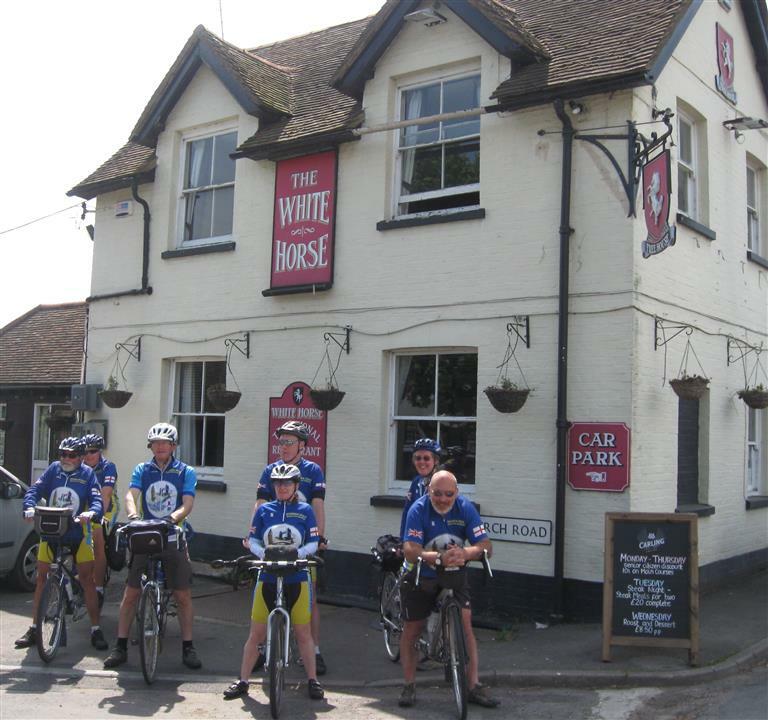 We then passed through the villages of Wrotham and Borough Green which led us to The Papermakers Arms in Plaxtol for lunch. 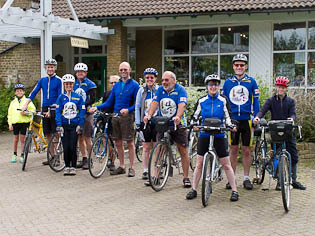 Our return journey took us through Crouch, Platt, West Malling and Snodland. 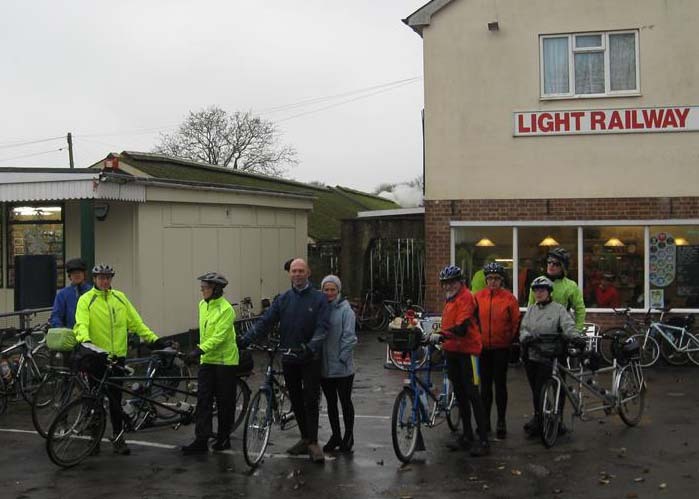 The last leg of our ride took us through Leybourne Lakes, where we saw the sun shimmering magnificently on the water before heading back to our house in Ditton for tea and cakes. As we were expecting cold winter weather for our ride, we only planned a 35 mile oute adding in a few hills to keep us warm. With the unexpected sunshine, we found that we were getting too hot and had to strip off!! 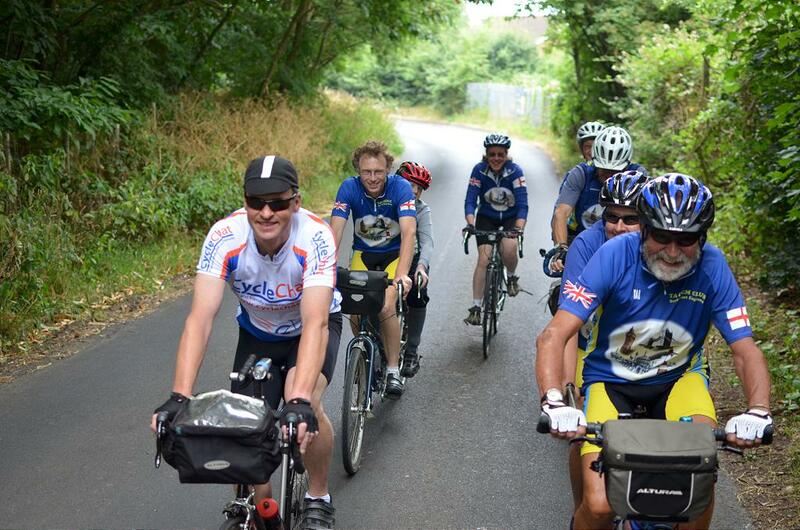 Thanks to all that came, as we had a fabulous days riding with great friends. 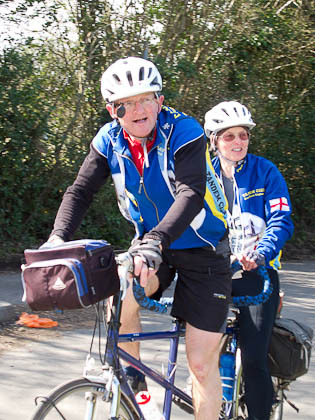 Cliff and Pauline need to know who is coming by Friday 22nd March. With snowfall causing the cancellation of the January ride I woke up Saturday morning fearing the same fate may cause the cancellation of the March ride. Fortunately a very strong wind ensured that although there was more fresh snow by Sunday morning, the roads remained dry and ice free. 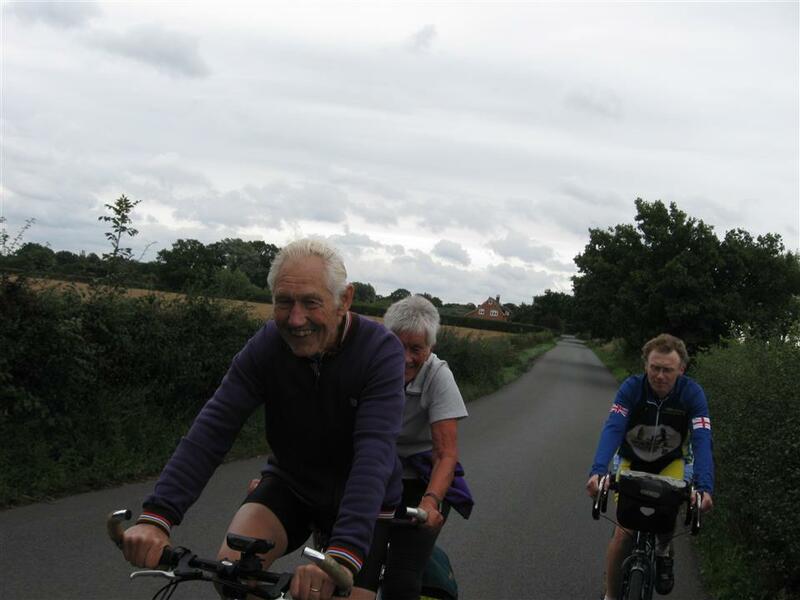 However, this same cold wind put off anyone with a small amount of sense, so that we were met at Bekesbourne only by Liz and Ken. The very quaint villages of Patrixbourne, Bridge, and Bishopsbourne went largely unseen behind streaming eyes as one was more concerned with generating some heat. Fortunately we reached a sheltered wooded valley and followed this to the Lord Whiskey tea rooms, where, over a long break we managed to warm the hands and feet. A number of steep climbs out of the Elham and Lydden valleys helped to generate some warmth, but it was still a relief to reach the Bell at Shepherdswell for lunch. The landlord delayed our departure somewhat, telling us stories (rather unusual today). Not that we were in a hurry to leave, but it gave us an excuse for having to take the shorter option for the afternoons ride. 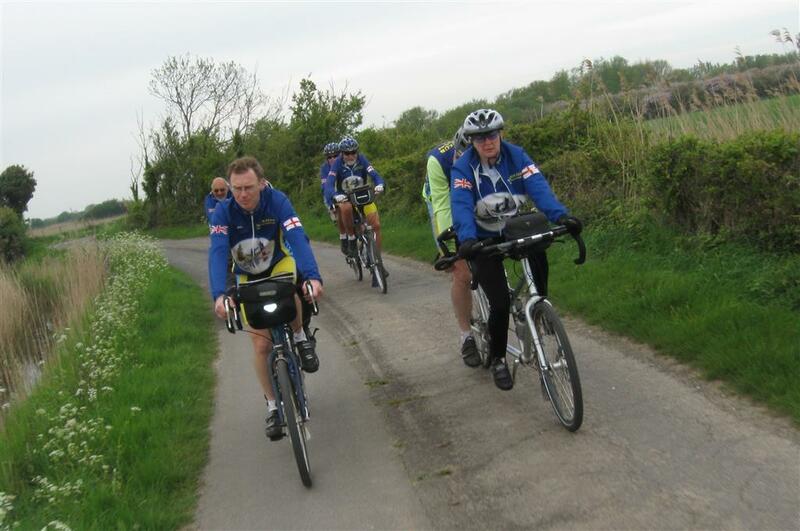 Heading through Nonington and Goodnestone to Wingham Green and Wickhambreaux directly into the wind, it was a great relief to reach Stodmarsh and turn west for Canterbury. 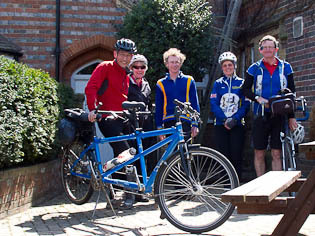 After tea in Liz and Ken’s campervan, we finally returned to Bekesbourne station, having completed 40 miles. A joint ride with the SEL region. 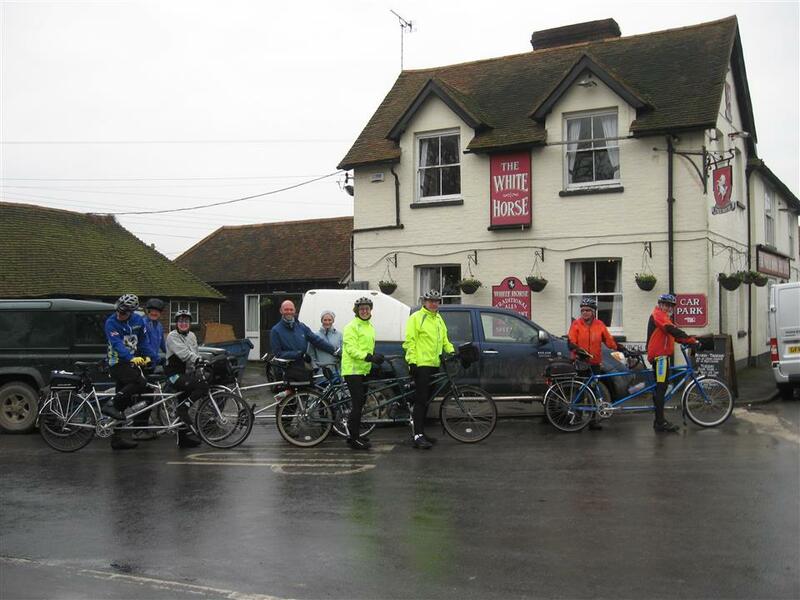 We will have lunch at a pub in Headcorn. 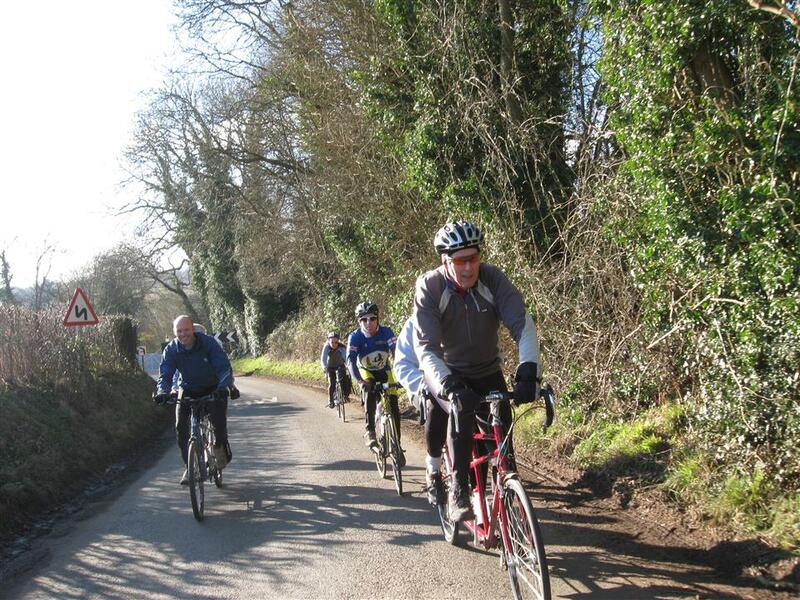 Please contact the ride leaders for more details of the start. Made it! Who put that hill in? 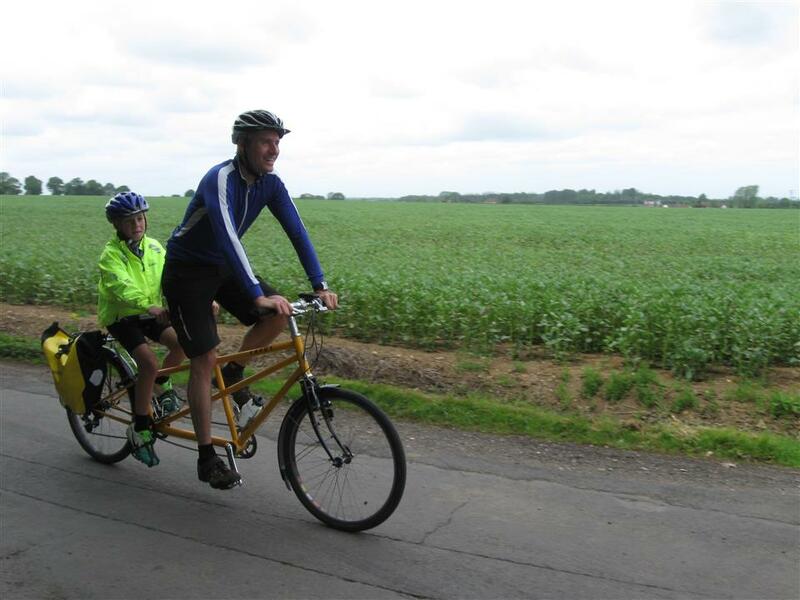 It was overcast when 4 tandems and 2 solos set out from Ditton. 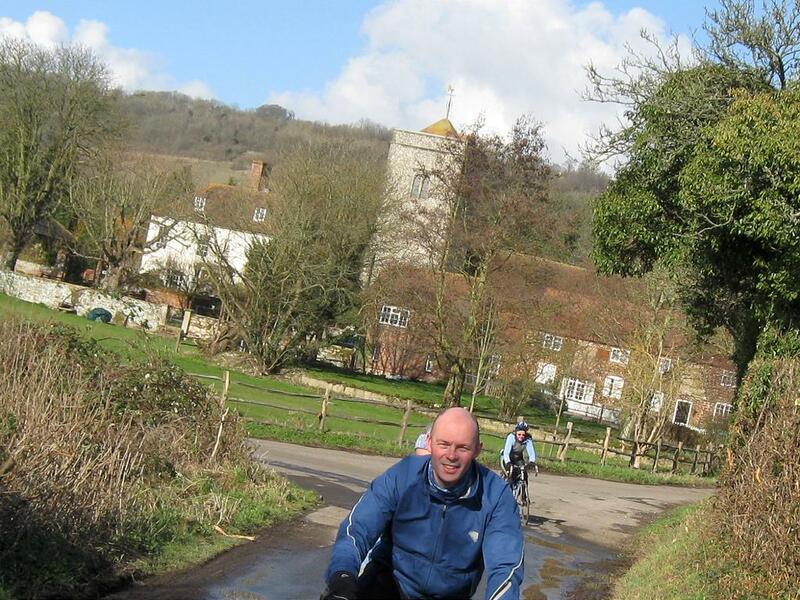 We crossed the river at Teston and Yalding as we headed to our coffee stop at Wyevale Garden Centre in Paddock Wood. 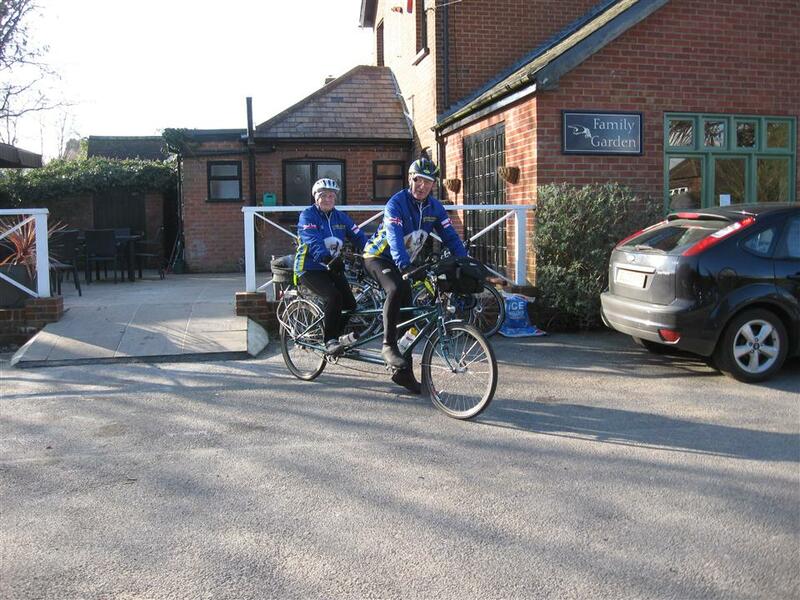 As we were sitting outside in the Garden Centre re-fueling, the haze cleared and the sun was blazing. It was so hot we had to put up the umbrellas to get some shade! 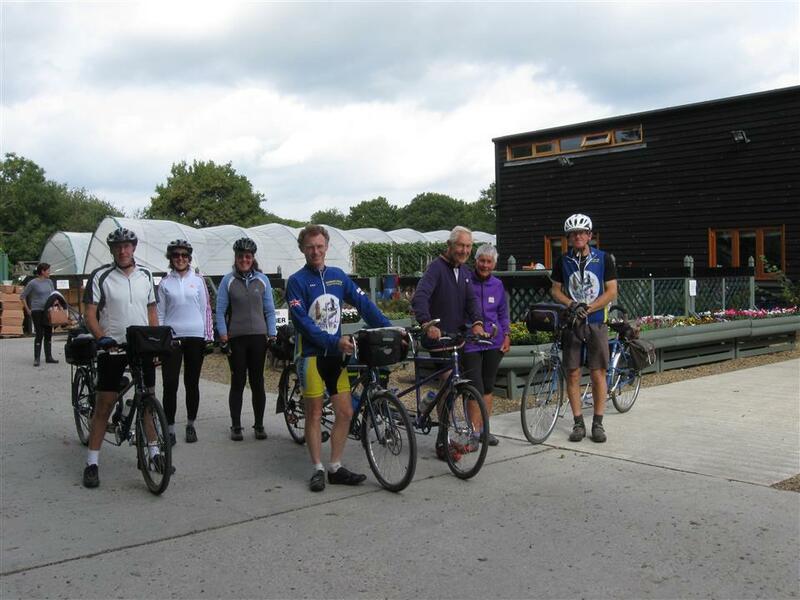 From here, we cycled 20 flat miles through Claygate, Marden, Staplehurst and Headcorn and arrived at Grafty Green Garden Centre for our lunch. 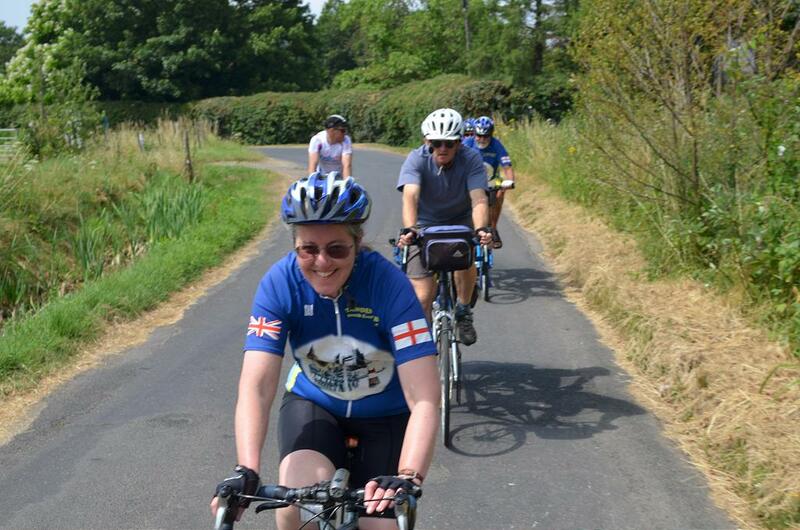 It was an 18 mile undulating ride home, which took us up Chart Sutton Hill and then through Loose and Tovil. We crossed the river again using the wooden bridge at West Farleigh. 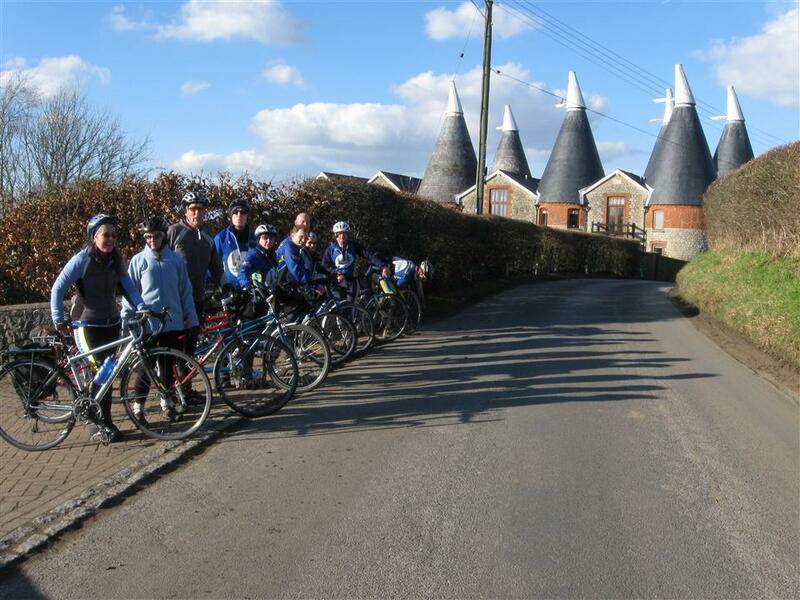 We then cycled through Barming and took the track though the woods which lead us back to our house for well deserved cakes and refreshments. Rita and Maurice say, we will meet at 9.45 for a 10 o'clock get away in Cranbrook. 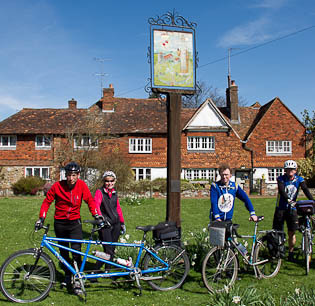 Our ride will take us through local lanes to coffee, with lunch at Hawkenbury. 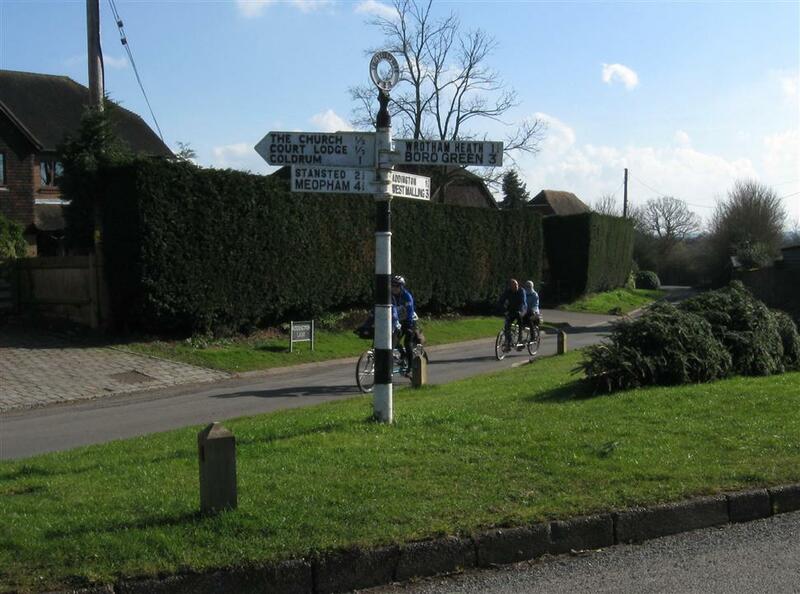 A circuitous route will end at Hartley for afternoon tea for those who want it with the start point just a mile down the road after a total mileage of approx 42 miles. 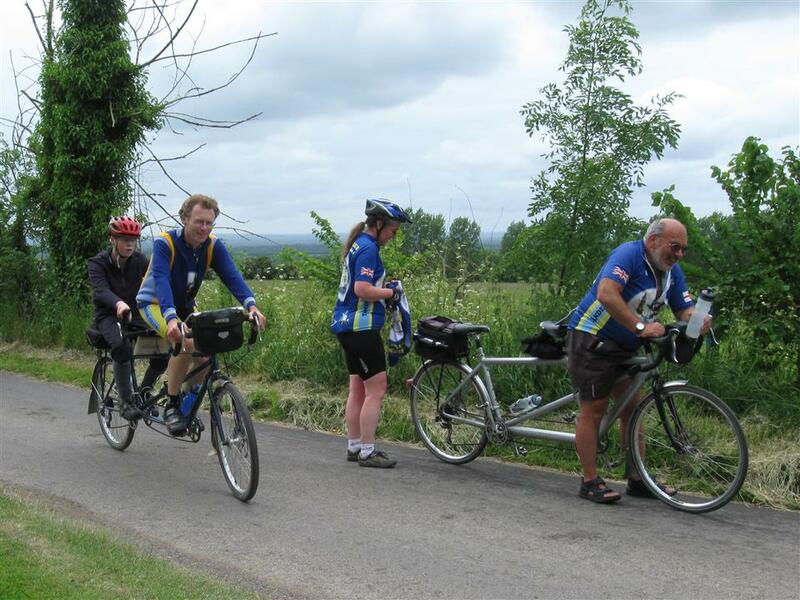 Please would you contact them to get exact details of the start location. On a beautiful September morning 8 of us left Cranbrook car park for the day's ride. 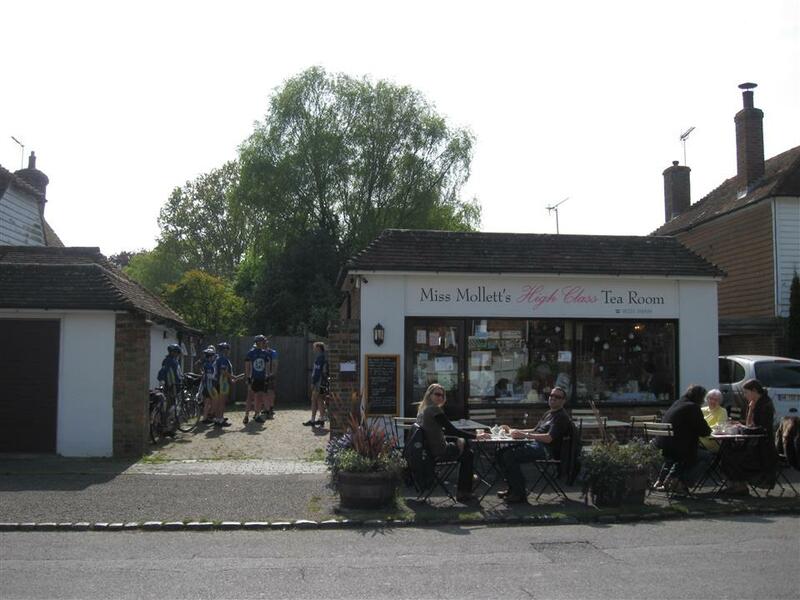 Coffee was taken at Clapper Farm, near Staplehurst, half of us choosing to sit out in the lovely warm sunshine. Leaving coffee we made our way through quiet lanes to within a few yards of our lunch stop only to be diverted on a 12 mile loop before returning to our lunch stop at Hawkenbury. It was during this diversion that the weather started a downturn. The wind picked up, the sun went in and the temperature went down and after lunch it was decidedly chilly. 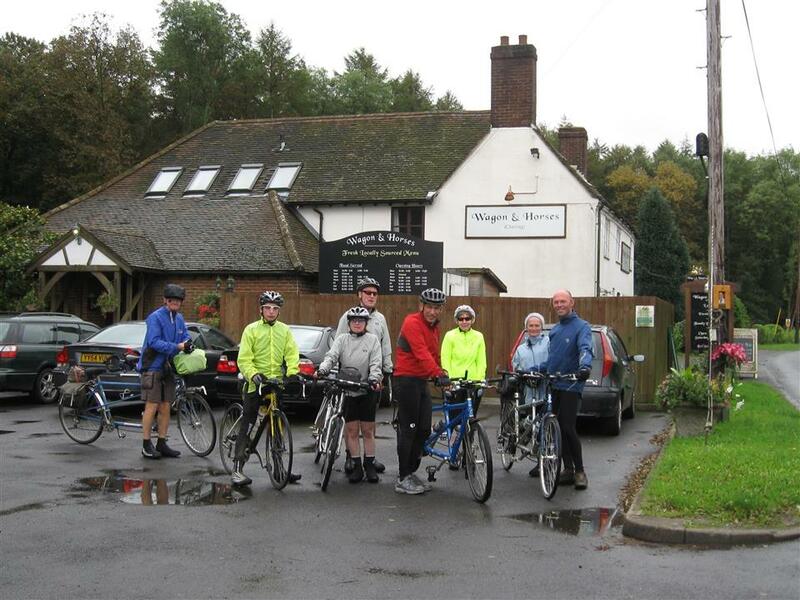 Another loop round via Biddenden and Benenden brought us to Hartley during which it decided to rain, but we made the café just before they closed and without getting too wet. A couple of miles further on saw us back at the car park having covered a distance of 44 miles. 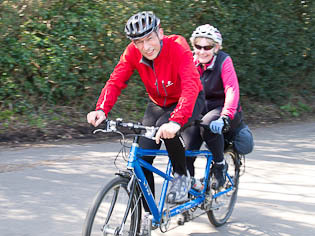 Jim and Kate say, we are going to start at Whitstable and then head through the country lanes for a short circuit up to Faversham for a coffee stop (about 10 miles), then out of Faversham and cross the A2 at Norton Ash for a nice rolling 20 miles across the downs to the Wagon & Horses just outside of Charing for a Sunday roast (£7.95 a head). Finally 15 miles back to Whitstable taking in Dargate just so those of you who like hills don't feel left out, slightly longer than usual at 45 miles. Let us know sometime during the week before so that we can confirm numbers with the pub and give you the exact start details. Kate and I started the weekend by looking at weather forecasts. Google predicted sunny spells with 0% chance of rain, Wind Guru forecast 30mph winds in the afternoon and BBC weather said it was going to be cloudy with some sun but frequent torrential rain. Who to believe? 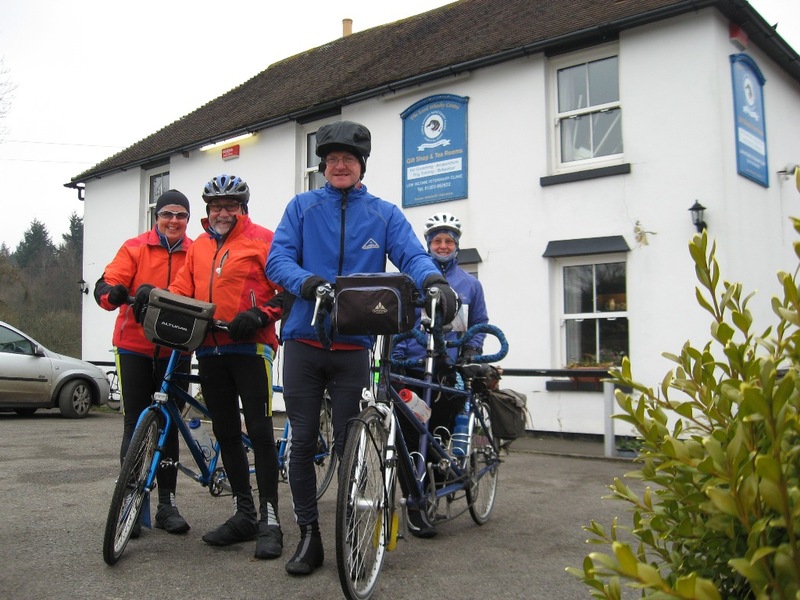 We woke up Sunday morning to rain tapping lightly on our bedroom window but after a pot of coffee and cereal the sun was trying to come out, so onto the tandem and a short ride up to the meeting place. On the way we saw some beautiful rainbows over the sea, and you guessed it, you only get rainbows if there is rain about so we had a quick drenching before we even got to the start. 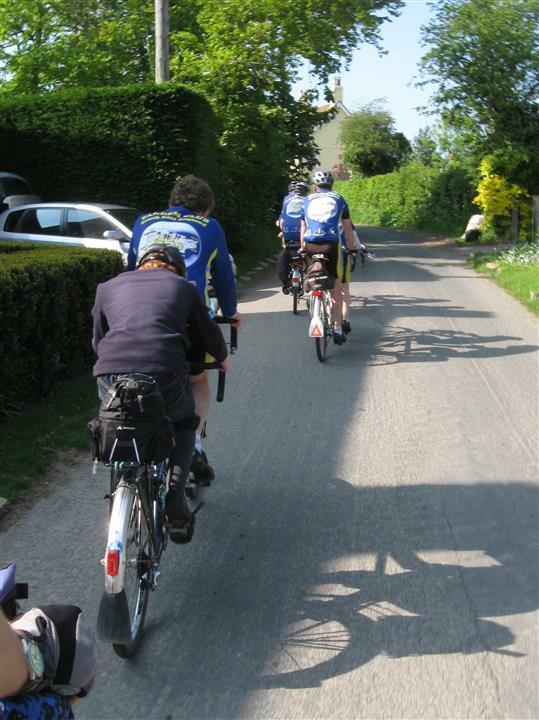 As the few brave tandem souls turned up they were greeted by some beautiful sunshine, which caused the dilemma of legs or shorts, in the end we had a 50% mix, some braving bare legs while the softer ones of us riding in legs. 4 tandems and Jake our “hill man” on his solo got ready to leave as the heavens got ready to rain. 2 miles later and the heavens decided to really rain and mix a bit of strong wind with it. Not quite hailstones but big enough to start stinging your face. A single file of head down cyclists left Whitstable. A few miles out of town and onto some lovely country lanes the rain stopped and the sun started to try and come out. 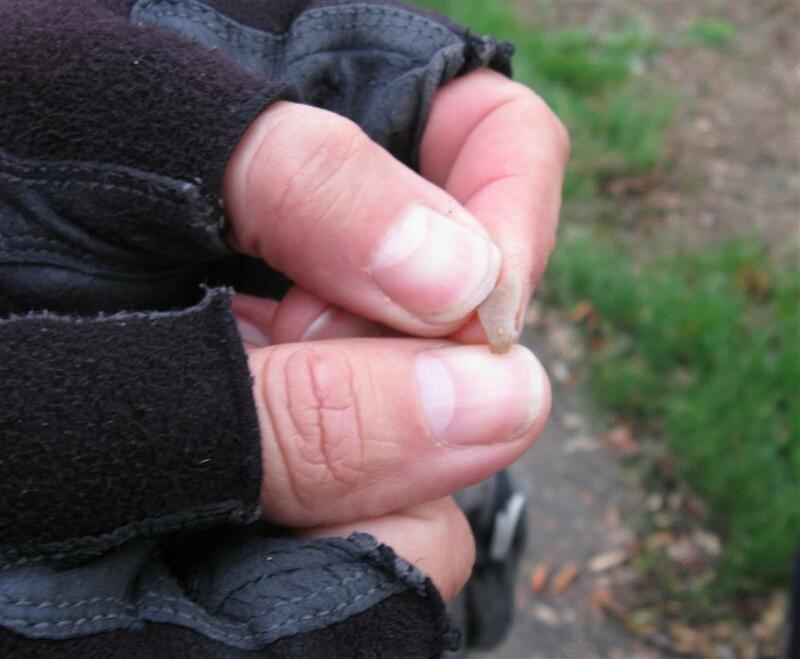 We had great views with acorns crunching under our tyres along with all sorts of other rubbish washed into the road. The first part of the ride was rolling/hilly depending on your view, keeping everybody warm with a few small climbs and not too long downhill sections. I had been warning everybody to be careful as some areas of road will be slippery, but ironically Kate and I nearly fell off as we hit a rather thick muddy centre section of road trying to avoid a puddle. With the warm SW wind blowing like a hairdryer we arrived at our coffee stop 11miles later only slightly damp around the edges. We stopped at Macknade’s fine food emporium in Faversham, which is a great food shop to nose around and treat yourself to something special, certainly not your standard Tesco’s. What it also has is a lovely coffee shop at the back which sells great coffee and cake or light lunches and plenty of spare room out front to park the tandems as well. We left the coffee shop and the sun was still trying to shine. 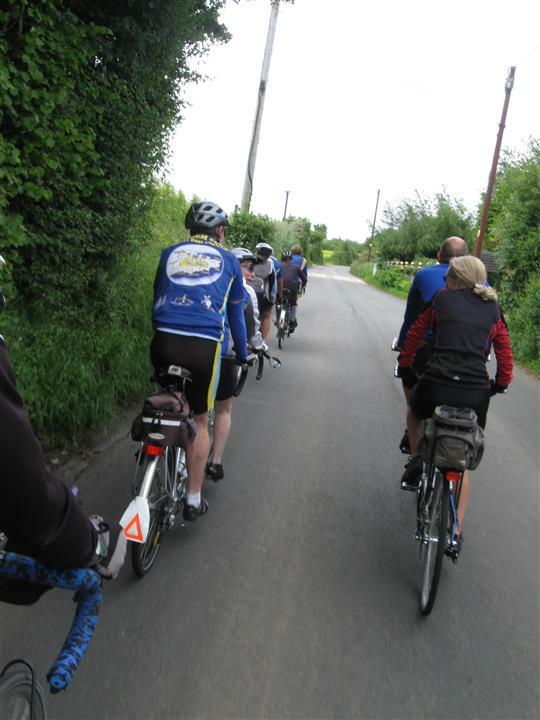 A few cycle paths and back roads and we were through Faversham picking up the route 1 cycle path out towards Teynham. 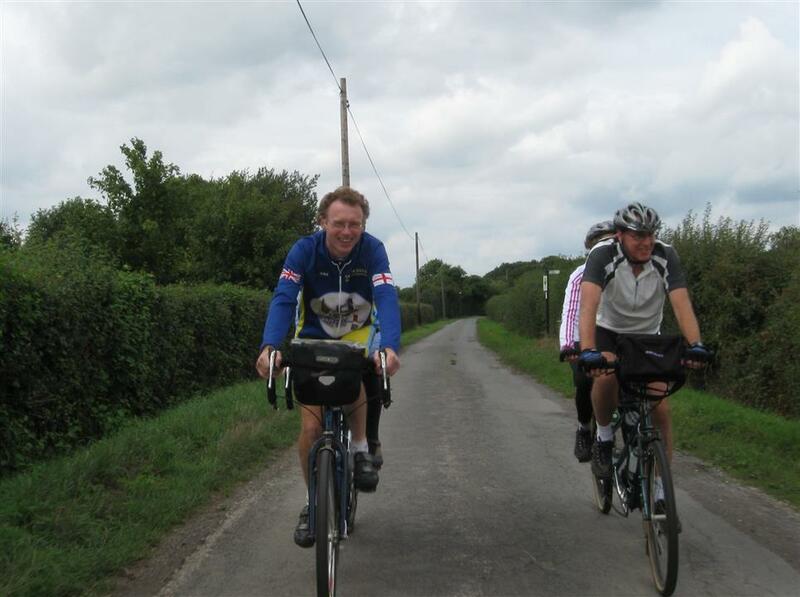 Once away from Faversham you are on single track roads, which when dry, are a pleasure to ride. 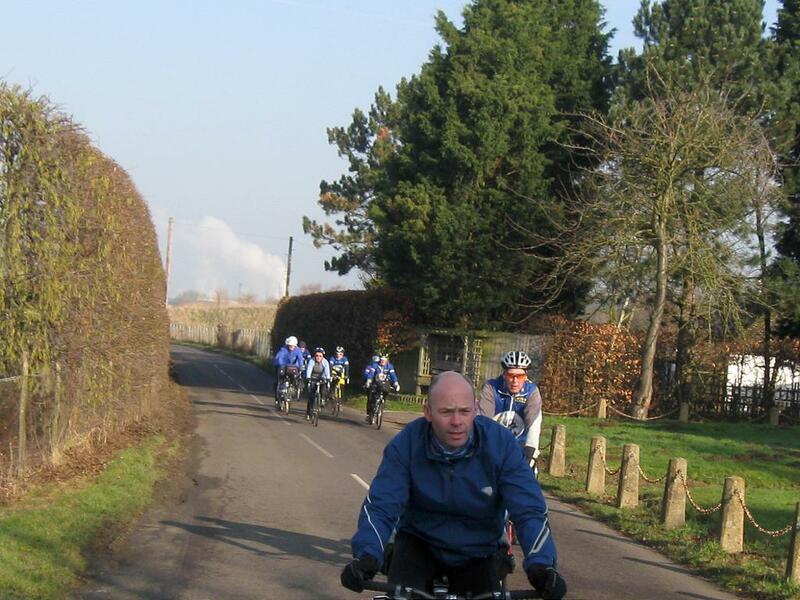 We cut across the A2 at Norton Ash to start our first long uphill drag. 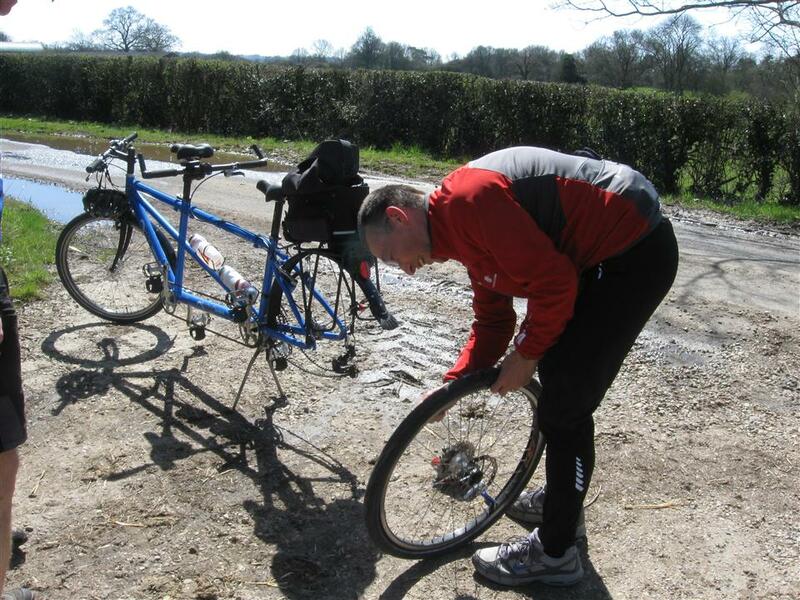 Considering it was uphill most of the way we still managed to come across quite a few larger than large puddles which for some reason always seem harder to pedal through, as if the stoker would take their feet off the pedals to save getting wet feet! The sun had come out to play by now and we even had to stop to allow a few to strip off a layer. 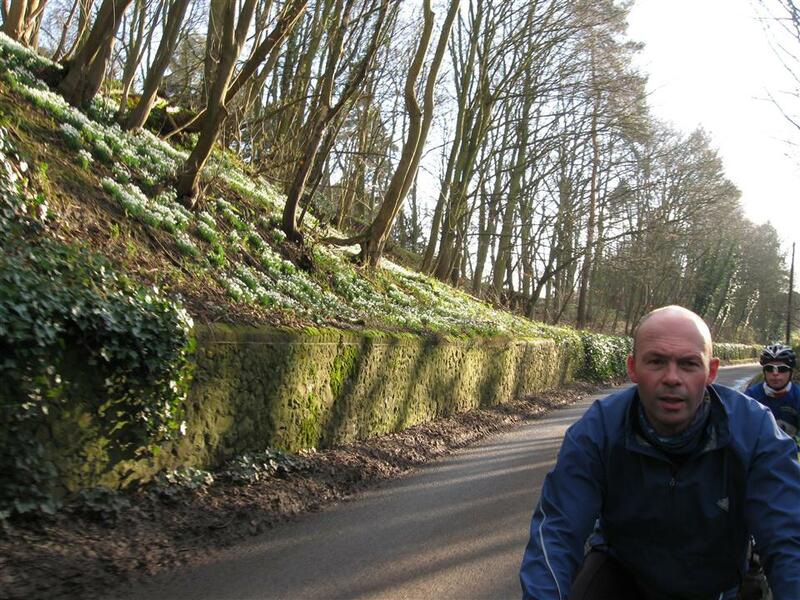 We then cut across to Doddington for a run of three hills which were narrow, wet, with a nice green layer down the central part, so no one made use of the downhill to gain speed to carry you halfway up the other side. This section I was hoping Jake would be of some value to pace us up the hills, all he did was demoralise us as he left us struggling and rode off into the distance. The road become more fun through orchards and woodlands as we got closer to lunch stop with some longer downhill sections. The sun was still shining. 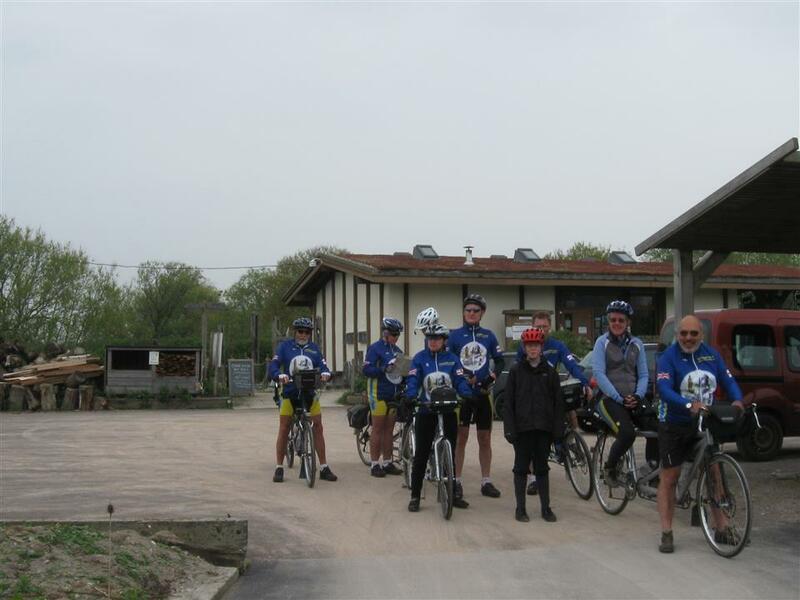 We arrived at the lunch stop, dry and looking like we have had a good dry ride. 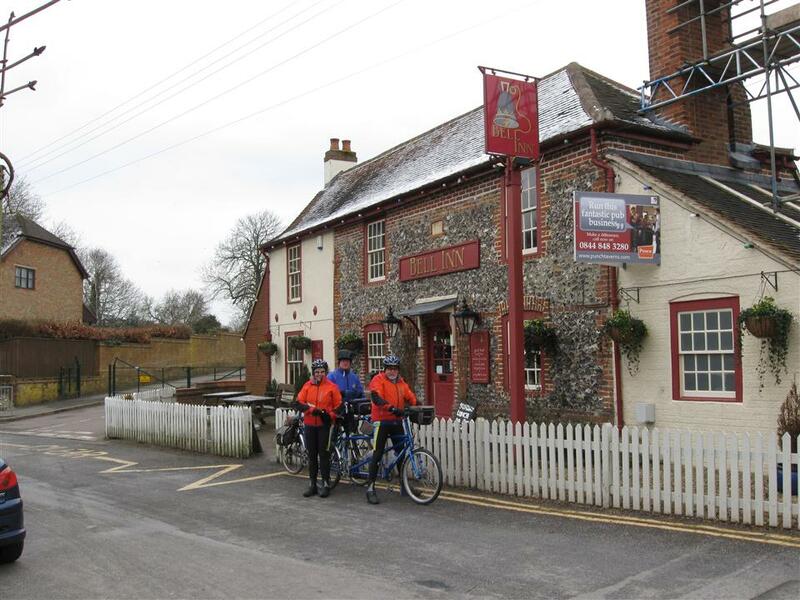 The pub was the Wagon and Horses on the Faversham side of Charing hill (another tandem friendly stop with plenty of room to leave the tandems out of sight around the back). The food served was plentiful; a mix of roasts, wagon burgers and salads were consumed all at a good price, definitely worth another visit. It even has a Caravan club campsite attached for any motorhome owners reading this. 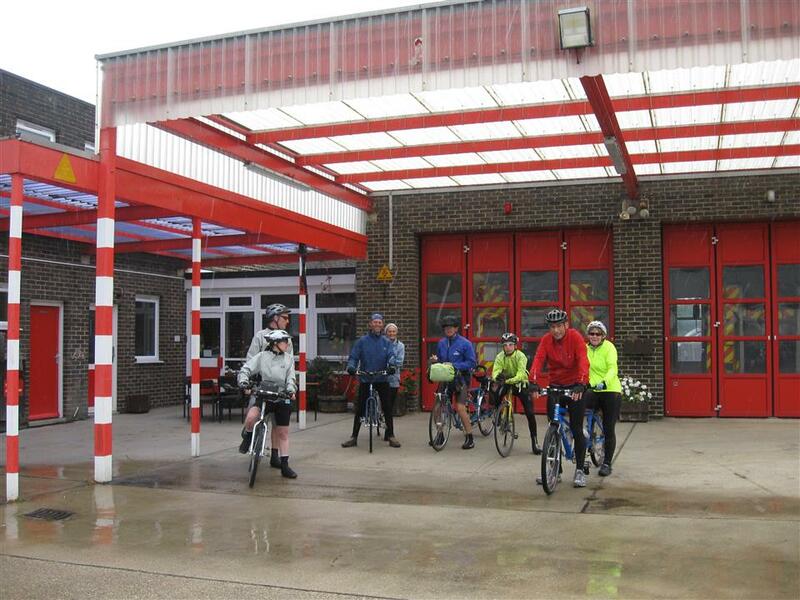 Halfway through lunch we heard that familiar sound of rainfall on the windows, who cares we were inside and eating well but in the end we had to leave as we still had 15 miles to get back to Whitstable. The rain was light and everybody except Mark was thinking positive, we will get home before it rains hard again. 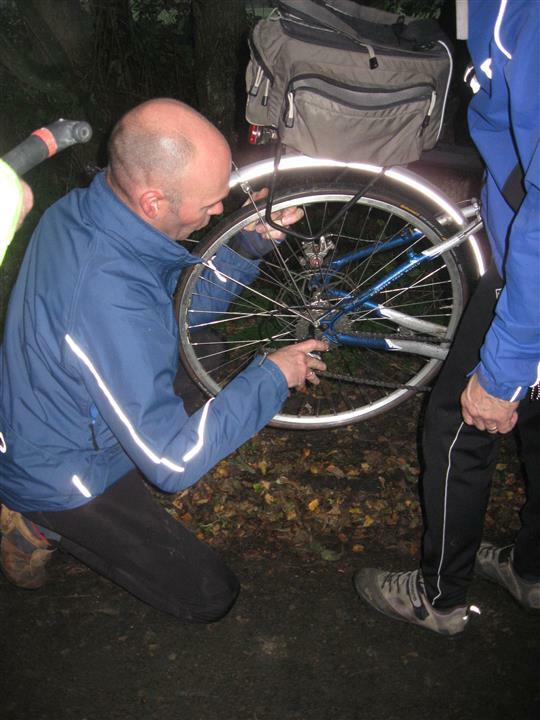 5 miles from the pub Mark has a few more positive thoughts – “No one’s had a puncture yet!” Bang, 2 in a row. 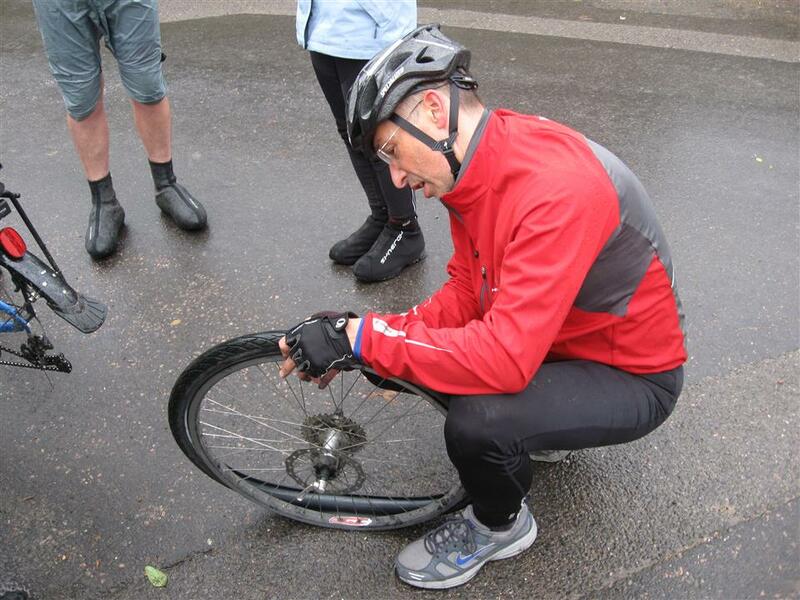 First Kate and I with a Stone Age arrowhead straight through the front tyre and then Mark and Jill a few minutes later and guess what? It started to rain harder. Liz please bring Mark again. 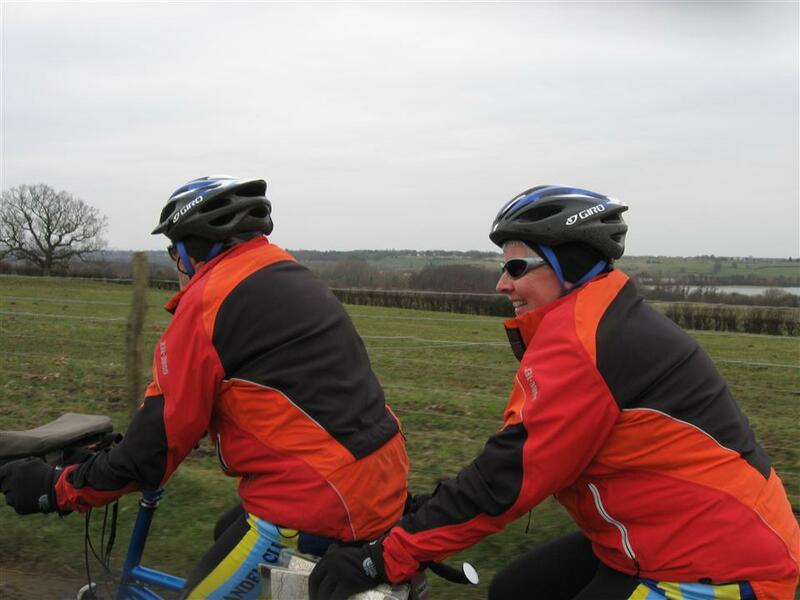 We started to enjoy the rolling section through to Shottenden and heading back to Boughton where we hit the big climb of the day, which is always tough, but with 30mph winds and heavy rain it did make it an effort. At the top of Dargate, you have beautiful views over the river Medway, that’s on a clear day, Sunday all you could see were rain clouds. With a fast downhill section with driving rain and strong winds behind for a change it was the stokers chance to soak up the rain which was still getting heavier; the roads had started to run water. 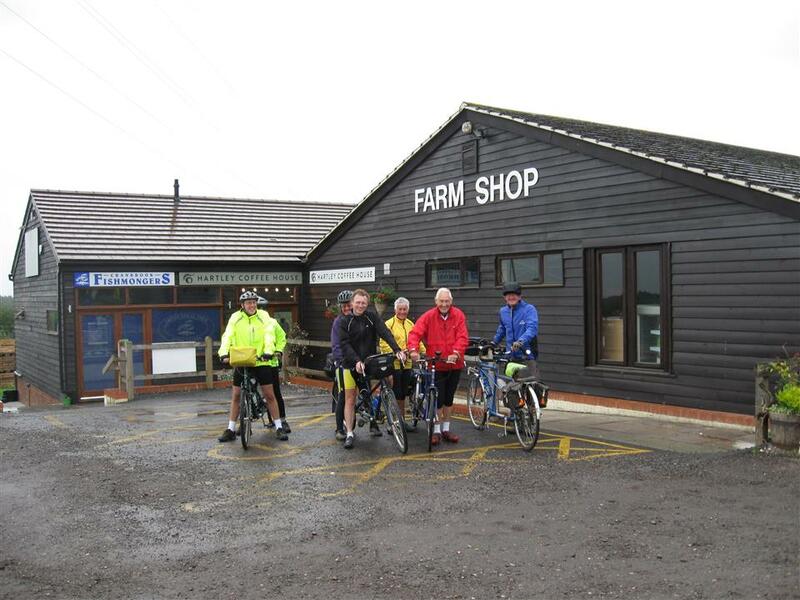 2 miles from Whitstable and one short hard hill to home but by now we were in a monsoon. Luckily the wind was still behind. 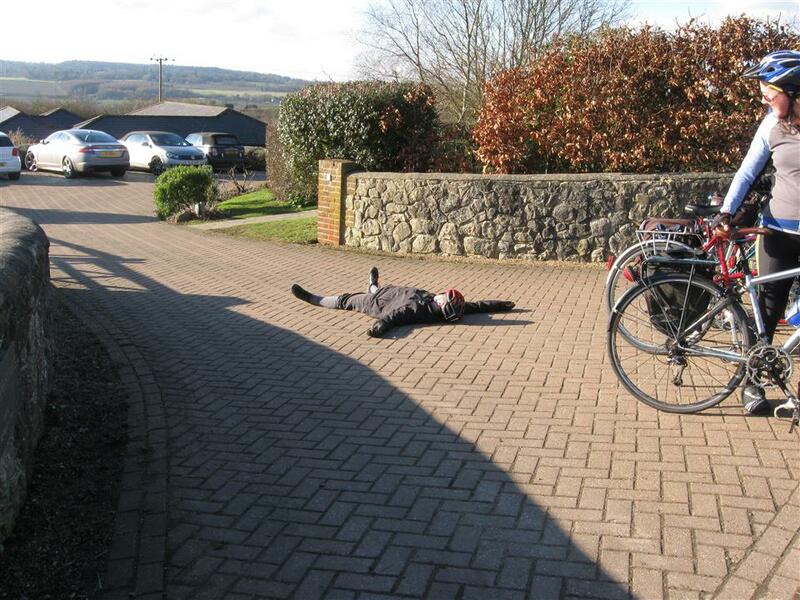 Jake summed it up at the end of the day; he had never ridden up hill and against the current before. There must have been close to an inch of water running down the whole road as we climbed up to the top. Once back to base, we had the luxury of a drying room and a warm room to sit whilst Kate made us coffee and tea and shared her half eaten white cake with us. As we sat there and dried off it was easy to forget the rain and talk over all the fun we had just had. So to conclude: Google weather is rubbish, and rolling means being able to go down the hills quick enough to get up the hill the other side. Thanks to all those who braved the day. Kate and Jim look forward to seeing you all again soon. Following the Pilgrims Way below the North Downs, for coffee at Hythe, heading across Romney Marsh to lunch at Bilsington. 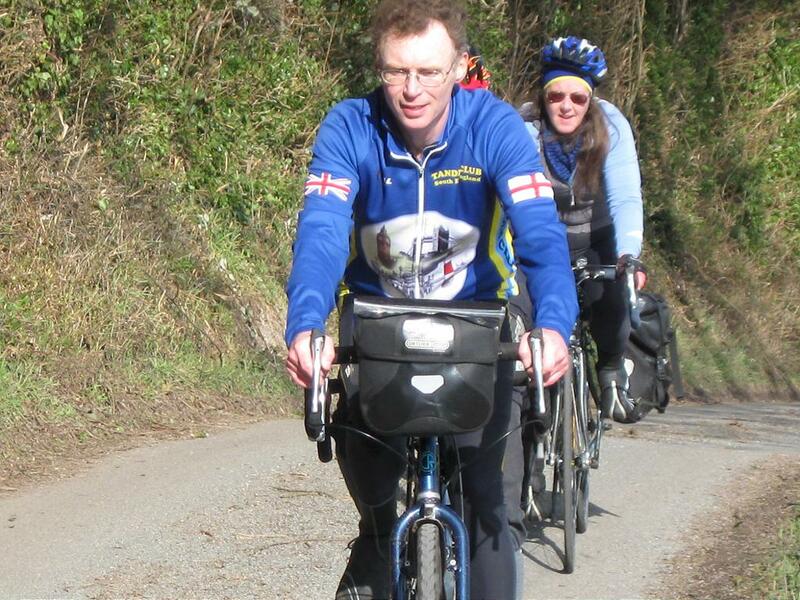 Then returning to Wye. Please call or email us so we can let the pub know how many are for lunch, and for exact details of the start location. 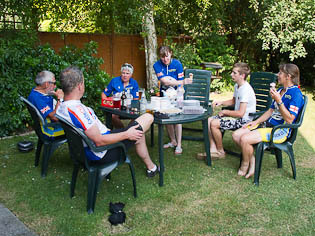 A good meal - now many hills did you say Cliff? 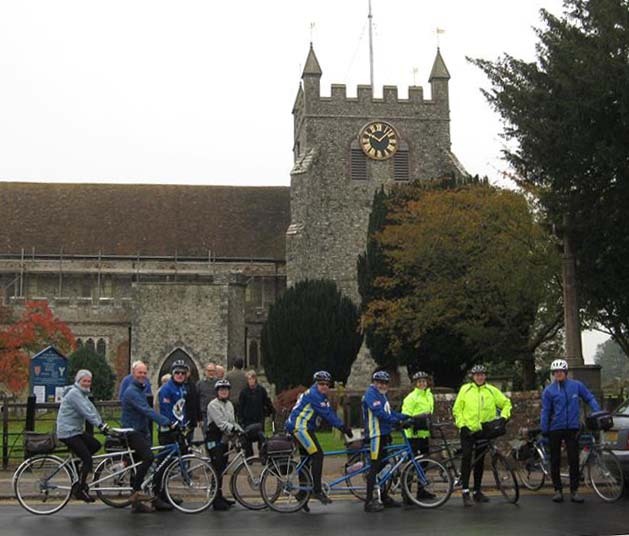 Five Tandem crews were greeted to Wye by the loud bells from the church. If the bellringers were trying enthusiastically to encourage one to church, a notice on the wall adjacent to the Lynch gate warned of two locals who were hanged for their religion, so we took this as a warning and rapidly departed. Initially East towards the rise of the North Downs but then turning South east along the Pilgrims Way through Stowting to Postling. Crossing the M20, it began to drizzle, but a fast downhill run through Saltwood to the café at the terminus of the Dymchurch railway ensured that we missed to worst of the rain. The cycleway west from Hythe follows the Military canal and we were for a short time racing a miniature stream train on the far side. 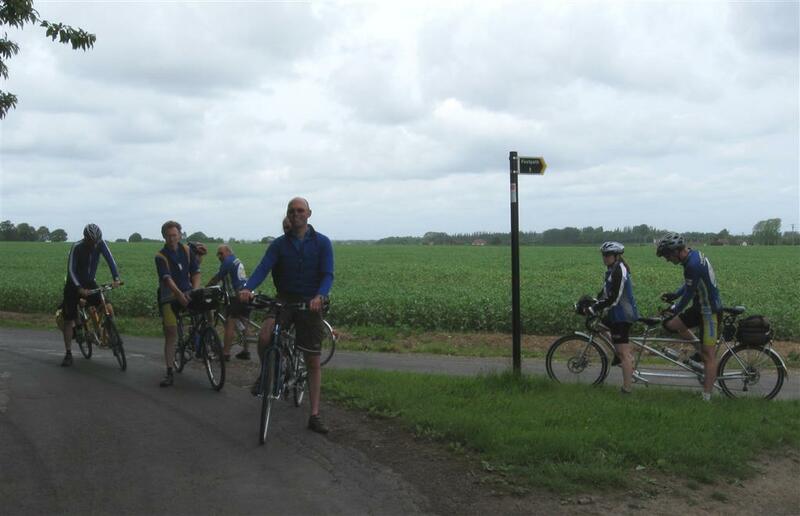 We left the cycleway at West Hythe and headed across the flat expanse of Romney Marsh. 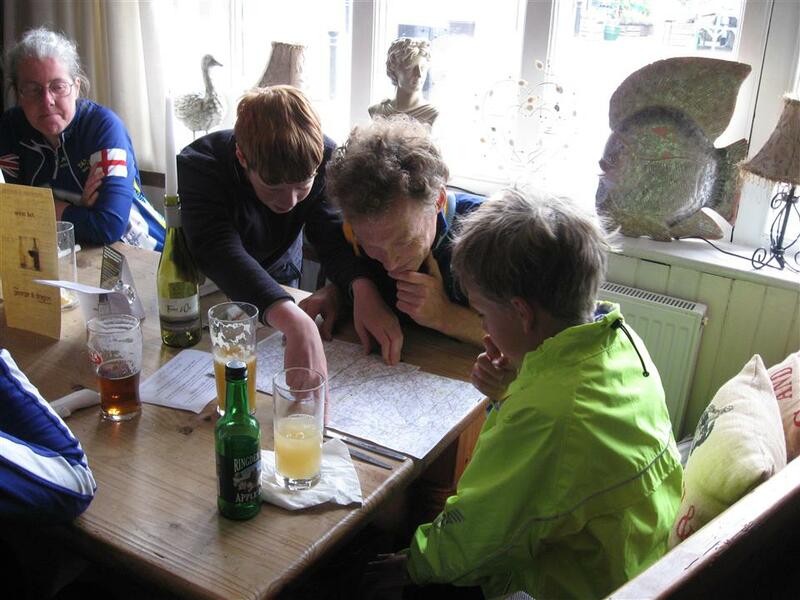 First to Burwash then Newchurch, before re-crossing the canal and climbing to Bilsington for lunch at the White Horse. Continuing Northwards along the flat countryside to the South East of Ashford, we eventually had no choice but to ride along the A20 for about a kilometre. In an attempt to get off it as quickly as possible, we found ourselves travelling the wrong way on a one-way street, much to the condemnation of a couple of motorists. At Hinxhill we took the farm road. This has now become an official cycleroute free of traffic. Unfortunately we missed the turning and rode over a mile before realising. 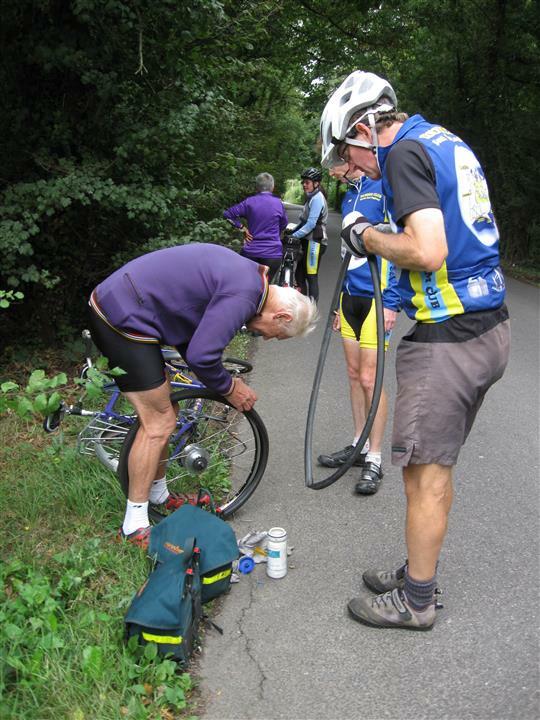 Jim should be congratulated on the speed at which he changed the tube after puncturing, to ensure that we arrived back in Wye before it got dark, where Pauline provided refreshments and cake to sustain us for the drive home. Our Christmas lunch will be a joint affair with Kent and Surrey & Sussex Regions. It will be held at the Mercure Tunbridge Wells Hotel, located just off the A21 near Pembury, Kent at 1pm; cost for 3 course meal and coffee is £20pp, to include a very small tip. This is a pre-booked event with all bookings, full payment and menu choices to be with Tricia by Monday 25th November 2013: please contact Tricia ASAP to express your interest in joining us at this event: a more detailed e-mail, giving menu choices, venue directions, etc, will be sent out in October.